Coat chicken with flour; shake off excess. Heat oil in large skillet on medium-high heat. Add chicken; cook 6 to 8 min. on each side or until browned on both sides. Remove chicken from skillet, reserving drippings in skillet; cover chicken to keep warm. Add mushrooms to drippings in skillet; cook and stir 2 to 3 min. or until tender. Stir in mustard and wine. Return chicken to skillet; spoon sauce over chicken. Bring sauce to boil; cover. Simmer on low heat 7 to 10 min. or until chicken is done (165°F). Sprinkle with parsley. Season the flour used to coat the chicken with a dash each of black pepper and paprika. Cook red and green pepper strips with sliced onions to serve alongside the chicken. 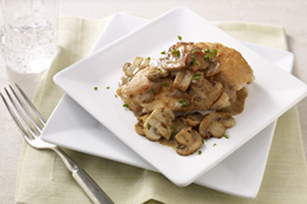 Prepare using bone-in chicken breasts and increasing the final cooking time to 20 to 25 min. or until chicken is done.